History is the story of Man, his civilisation and his progress – “His-story” the story of Man’s evolution and development. Not many historians viewed history in this evolutionary or developmental perspective. Even those historians who saw in history the progressive march of humanity, focused only on the outer progress and ignored the inner dimensions of history. In this article, we are presenting the basic principles of a psychological and developmental vision or approach to history based on Indian insights and Sri Aurobindo’s vision. This requires an organic vision of the individual and the collectivity as evolving and developing organism. Our human society and history is the result of the interaction between the individual and the collectivity. And human development in the mass is the result of the complex mutual interaction and interdependence between the development of the individual and the collectivity. So a psychological and developmental approach to history requires a clear understanding of the psychological structure of the individual and the collectivity. The individual human organism has a physical dimension made of his body; a vital dimension made of sensations, emotions, desire, vital-energy and will; a mental dimension made of intellectual, aesthetic and ethical being and their thoughts, perceptions, intuitions, ideas and ideals; and beyond all these a spiritual or soul dimension which is a spark of the supramental consciousness of the universal and transcendent Spirit. But there is one more important psychological factor which is ignored in most of the psychological classifications; it is the Ego-factor. For, in most of the human mass, except a few exceptional spiritual personalities, their physical, vital and mental being are organized not around the spiritual self, but around the ego. Until we realise our spiritual self, it is the ego which centralizes all the experiences and activities of our body, vital and mind and gives us the sense of personal identity as someone distinct and separate from others. The Ego is the source of that obstimate self-interest in man which is one of the most dominant psychological factor that had driven human history in the past and the present. We will come back to this Ego-factor a little latter. Let us now move on with the inner and outer structure of the collectivity. Similarly a collectivity or group has a body made of its geography and ecology; a vital dimension made of the collective emotions, desires, life-energy and will of its people, expressing itself in the economic, social and political life of the community; a mental dimension made of the intellectual, ethical and aesthetic temperament and energy of its people expressing itself in the cultural life of the community; a spiritual dimension which contain the essential purpose and genius of its soul and its mission or contribution to the fulfillment of the human density. This spiritual dimension of the individual and the collectivity is also the source of all higher values and aspiration of humanity for truth, beauty, goodness, harmony, unity and perfection. And as in the individual we have to add here the collective ego, which serves more or less the same function as the individual ego. But we must note hare that the consciousness of the collectivity is not merely the sum of the consciousness of the individuals belonging to the collectivity at a given period of time. The collective consciousness taken as a whole contains not only its present consciousness; it also contains in its subconscious memory, the impressions of all the thoughts, experiences and realizations of its past history and in its superconscious or spiritual self, in a sort of future memory, the intuition of its future destiny. The other important aspect of this psychological and spiritual heritage of a collectivity is its unique and inherent temperament and genius. Each major group or civilization or culture, in its course of historical evolution, develops a certain distinct inclination for and competence in a particular field of human activity or knowledge like for example the religious and spiritual temperament and genius of India, the aesthetic and philosophic genius of ancient Greek mind, the robust and strong practicality and organizing genius of Romans, finely balanced ethical and intellectual temperament of the ancient Chinese mind, the austere ethical temperament of the Hebrews. For nothing which happens in the psychological realm is lost or disappears. Every experience, realization, or achievement or the capacities developed, leaves a subconscious impression, recorded or retained in our subconscious memory. This applies to the individual as well as the collective psychology. This subliminal part of the collective psyche has a subtle and invisible influence on its outer life and history. It tends to repel alien influences from other cultures which are contrary to its inborn temperament or harmful to its natural growth and assimilate helpful influences to its own natural temperament and genius. We are now in a better position to understand the ideal of individual and collective human development through history. If the integral development of the body, life, mind and soul suggests itself as the most logical and highest ideal of human development in the individual then the integral development of the body, life, mind and soul of the collectivity suggests itself as the most logical and highest ideal of human development for the collectivity. This is probably the plan and purpose of Nature in human history. The march of history may be viewed as a progressive education of the human race towards a gradual awakening to and realization of the ideal. ii. realization of the spiritual self which means to become conscious of the spiritual self and unite with it. iii. Organize the physical, vital and mental being around the spiritual self and make them into harmonious and integrated instruments and self expression of the Spirit. Similarly, the ideal of integral development of the collectivity involves. i. full development of the ecological, economic, social and cultural potentialities of the group. iii. Organise the ecological, economic, social, political and cultural life and energies of the group around the consciousness of the group-soul and make them into a conscious, harmonious and integrated expression of the group-soul. The ideal for humanity as a whole is to inwardly realize the global supramental consciousness of the Spirit and make the entire external life a harmonious and integrated expression of the global consciousness of the Soul and Spirit of Humanity. 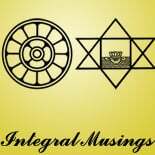 The ideal may be expressed in many different words or formulas like for example, integrated individual in an integrated or unified society or as Sri Aurobindo puts it “Perfected Individual in a Perfected Society” or a global Civilisation on the foundation of a global Consciousness. The entire history of human civilization is perhaps a more or less unconscious or half-conscious groping attempt of the human mind and life toward this ideal, impelled inwardly by the spiritual and psychological forces of our own self and universal Nature, and outwardly by the pressure of external circumstances and environment. Each major nation or civilization has to contribute or has contributed something to the realization of this ideal or a part of the ideal. And each major nation or civilization is endowed by Nature with a unique genius or capacity which corresponds to its mission or contribution to the fulfillment of the human destiny. But in our approach a Nation or civilization is in its essence a psychological and spiritual entity and only secondarily a geographic or a political organism. Each major Nation unit or civilisation is an expression of some inner spiritual, mental, ethical, aesthetic and pragmatic qualities, tendencies, potentialities or faculties of the global consciousness of the human species. An ideal nation-unit is a group of people sharing a common spiritual heritage but with a unique stamp of their own distinct from other units; expressing this inner heritage which is also its inner and higher self, harmoniously through a single political entity in its outer material, economic, social and political life; and located in a well-defined geographical space or boundary. Looking from this psychological perspective very few modern nations are ideal nation-units. For in our modern age nations are formed not according to psychological or spiritual principles but on political consideration. So the soul or inner self of a nation-unit may be scattered or spread over many geographical or political entities. This means a complete recognisation of the nation units based on their inner spiritual and psychological realities is probably an important part of the integral ideal of human development through history. We have discussed so far the principles of a developmental vision of history. We may now examine the inner dimensions of the various aspects of history. We may broadly classify history into four categories: spiritual and cultural history; political and military history; economic, industrial and commercial history; and social history. Each of these aspect of human history is the self-expression of a part of the human consciousness. Thus the four aspects of history are the self-expression of the four major powers of human consciousness. There is a power or part in human consciousness which seeks for knowledge and values. We may call this part or power as the Mentor and its expression in life as Culture. There is another part or power of human consciousness which seeks for power, strength and mastery. We call this power as the Marshal and its outer expression in life as Polity. There is a third power of human consciousness which seeks for pragmatic skill and mutuality. We may call this power as the Merchant and its outer expression in the economic, industrial and commercial life as the Economy. And finally, there is a fourth power with an inclination for work, service and community. We may call this power as the Worker and its outer expression as the Society. Thus, in our terminology, Mentor, Marshal, Merchant and the Worker are respectively the inner dimensions of the cultural, political, economic and social history of humanity. But we would like to point out here, the four inner powers and their self-expression in the outer life is a process of complex interaction and should not be viewed in a simplistic, rigid and compartmental perspective. For the four inner powers are the powers of human consciousness and therefore they are present in every human being. All these four inner power of man act in various forms of combination and development through each individual and collective activity of the human being. It is the predominance of a particular power which determines the unique nature of the power or the activity. For example there is the play of the Marshal faculties wherever there is a forceful exercise of power and leadership. This can happen not only in politics or military but also in business, industry and commerce or even in culture, when a new idea fights against and displaces an old idea with a critical and combative force or when totally new horizons of knowledge were conquered. But when a particular power dominates the human consciousness we have a unique type of personality like for example the Marshal type and when this power expresses itself predominantly in a section of the society we have a specific social organ like Polity. Let us now examine the implications of this inner powers for history and human development. The spiritual and cultural history of humanity is the result of the seeking and self-expression of the intellectual, ethical and aesthetic mind and the inner soul in man for the higher values like God, truth, knowledge, beauty, goodness, harmony and unity. We can see in this part of human history, progress of the higher self in man and its intellectual, aesthetic, ethical and spiritual faculties and values. But when we say spiritual history of humanity we are not referring to the history of organized religions. The history of organized religions belongs to the cultural history of humanity. The dogmas, philosophies, literature and the art-work in temple and churches belong to the cultural history of humanity. But when the religion becomes an organized institution and tries to gain secular power through force or conversions it is no longer a spiritual or even a cultural institution but a political organism. The spiritual history of humanity lies first in the inner spiritual experiences of the founders of the religions of the world; second in the inner experiences of the great mystics in whom this original experiences which gave birth to the religions are more or less relived; third in the intuitions of some great thinkers whose minds are in living contact with their deeper spiritual self, like for example Socrates who always talked of an inner Daemon as his guide; fourth in the inner experiences and intuitions of modern mystics who might have made some new spiritual discoveries. The Soul of a Nation or civilization expresses itself through its Mind in the cultural life of the group. So the cultural history of a nation or civilization, the history of its religion, philosophy, science, art and literature gives an indication of its unique genius and the nature of the mission or contribution it has to make for the fulfillment of the evolutionary destiny of humanity. The spiritual and cultural history contains another important part of the human march: the March of Ideas. For Man is predominantly a mental being; so the thinking faculty of man and its ideas and ideals are the main instruments of his evolution and development. Most of the advance in the outer life of man, especially in the later part of human history were effected by great ideas or ideals. So in our approach to history study of the march of Ideas will be an important part of the research. We will study the inner and outer source of ideas and ideals, and the process of their birth, growth, impact and decline in history. In a developmental perspective, the importance of this spiritual and cultural dimensions of history are obvious. A nation or civilization may be great in wealth, technology, political and military power; but if it is spiritually and culturally weak and underdeveloped which means if the outer physical life of the nation is not chastened and guided by some higher mental, aesthetic, ethical or spiritual values and ideals then such a nation has not yet risen from barbarism whatever may be its economic, technological political and military achievements. If these barbarous tendencies are not checked and allowed to persist for long, it leads to a quick and reckless exhaustion of the vital energy of the nation in mindedness pursuit of material and sensuous enjoyment, or in violent internal conflict or external aggression or war-mongering. The political and military history of humanity is the expression of a that part of the vital-force and the will in man seeking for power, conquest, mastery expansion, law, order, unity in the outer life. We can see in this part of the history the growth of the qualities, faculties and values of the Will and one part or aspect of the vital force in man, like for example leadership, courage, heroism sense of honor and justice and the capacity for organized force and collective unity. Full development of all the potentialities of this part of the collective consciousness is also an important aspect of the integral ideal of development. A nation or civilization may be great and noble in its culture with lofty ideals, or efficient, productive and prosperous in its economic life, but if it is weak in this part of its being, it is susceptible to frequent barbarian invasion from nations which are politically and militarily stronger. Every creative and successful handling of a difficult or adverse challenge posed by nature or from the environment like for example natural calamities, foreign invasion or civil war help in the development of the will and vital force of a Nation or civilization. So what may appear outwardly as a negative or painful event for a nation may turn out be a blessing in disguise. For example, constant external aggression from barbarian nations may provide the impetus for a peaceful and cultured nation to gird up its loins and develop its political and military capabilities, which means taking a step forward to a more integral development of the community. Similarly foreign invasion or occupation may awaken political consciousness, or cultural identity and the urge toward political unity in a hopelessly divided or indolent or slumbering civilization. The economic, commercial, industrial and technological history of humanity is the expression of a second part of the vital force and the pragmatic mind in man, with a keen intuition into the changing, relational and practical aspects of life and seeking for efficiency, productivity, skill and prosperity in the outer life and action. We can see in this part of human history the growth of those faculties of human consciousness which come into play in organization, adaptation, execution, innovation, craftsmanship and harnessing the human, economic and material resources of life for the material realization of the Idea. A nation or civilization may be great in culture turning out great ideas and lofty values; it may develop a strong and powerful political or military organization; but without the capacity for organized efficiency in the economic and social life and a keen vital intuition into the ways of harnessing the economic and material resources, it will be lacking the capacity to quickly converting its ideas into material reality. The social history of humanity or a civilization, the history of the family, group, clan and the community, is the expression of the physical, instinctive and emotional being in man seeking to fulfill its basic material, biological and emotional needs for survival, security, enjoyment, to love and to be loved and for harmonious living with others. We can trace in this part of history and in the contents of the popular literature like the folklore and the novel which mirrors society, the growth of the mass-consciousness. This part of human consciousness is also the other source of economic history. For economy is made of not only the entrepreneur or the Merchant but also the consumer and his needs which the merchant seeks to fulfill. And a large part of the consumer belongs to the masses. Their needs for survival and enjoyment are some of the major shaping factors of economic history. A very large part of the human population, especially the work-force in the lowest levels of the social and organizational hierarchy, lives in this part of the human consciousness. Most of them may not have sufficient intellectual, ethical, vital, volitional or pragmatic capabilities to occupy leadership position. So ancient Indian thought viewed this part of humanity as fit only for obedient work and service to other sections of the society. But this ancient Indian concept is only a partial truth and doesn’t confirm to our ideal of integral development. But there is an important truth behind this Indian concept; it is that this part of human consciousness has the highest potential for hard work, patient execution and selfless service. So we may also call this part of human consciousness as the Worker. This last two part of the human consciousness, the Merchant and the Worker are important for realizing the aim of integral development. A nation or civilization may be great or strong in its Mentor or Marshall consciousness and their faculties and capacities; but if it is weak and underdeveloped in its Merchant and Mass consciousness, it will remain as a top-heavy civilisation and whatever its gains or achievements in its culture and polity will be confined to a few elite classes and will not percolate into the whole of society and the masses. Most of emotional transactions of people happen within the family, community and the work-place. So the emotional condition or development of a community depends to a large extent on the nature of the values and the organizations of the family and community life which is the source of society and that of the work-place and the work-life which is the source of the Economy. As we have indicated earlier that which is common to all these inner dimensions of history is the Ego-factor. In fact the history of the past and present was and is, the Age of the Ego. Since the dawn of human civilization and until now, most of the human life, of the individual or the collectivity, is driven by the Ego and its self-interest, either openly and consciously or covertly and subconsciously, with some specious idealistic, moral or spiritual justifications. If fact human history until now is worked out mainly through a clash of competing individual and collective ego, with each trying to enjoy and aggrandize itself at the expense of others egos. There are modern philosophies and social systems which openly and frankly proclaim this ego-driven life centred around self-interest as the best and the most efficient path to progress. There are other philosophies and systems which may not openly support the self-interest of the ego but mouth high ideals like individual liberty or “pursuit of happiness”. But, in actual life what rules is the Ego masking itself with lofty ideals. Some other philosophies and systems oppose ego-centric individualism and hold aloft the ideals of collectivism, cooperation, fraternity equality, nationalism or patriotism. But in actual practice, the collective ego takes over, and demands the total subordination of the individual ego to its own interest, ambitions and expansion. Wars are the extreme material result of this conflict of Egos. So we cannot understand the deeper sources of human history, especially its tragedies and failures, without understanding this important psychological factor, the Ego, and its influence on human life. The Ego is the arch-villain against all moral and spiritual progress. It is also the factor which dilutes and distorts all great ideals and pull them down from their shining and ethereal skies into the mud of self-interest, desire and greed. But this does not mean the human ego is all black and bad and there is nothing positive in it. The ego has also a positive role to play in the evolution of the individual and the collectivity. Nature uses the human ego to accomplish two evolutionary tasks. First is to prod the human organism from its indolent and prone inertia of its physical being and its bodily needs to its higher vital and mental needs and potentialities. And second, to progress from a condition in which it is sunk in a subconscious tribal mass and driven by subconscious instincts of the group to a status of self-conscious individuality governed by its individual reason and will. This entry was posted on April 9, 2012 by integralmusings in The Meaning of History.